1Instituto de Biociências, Av. Bento Gonçalves, 9500 - Bloco IV - Prédio 43433 - sala 214, Universidade Federal do Rio Grande do Sul. Brasil; luislima@redemeta.com.br (author for correspondence). 2Instituto de Botánica Darwinion, CONICET-ANCEFN, Casilla de correo 22, B1642HYD San Isidro, Buenos Aires, Argentina. 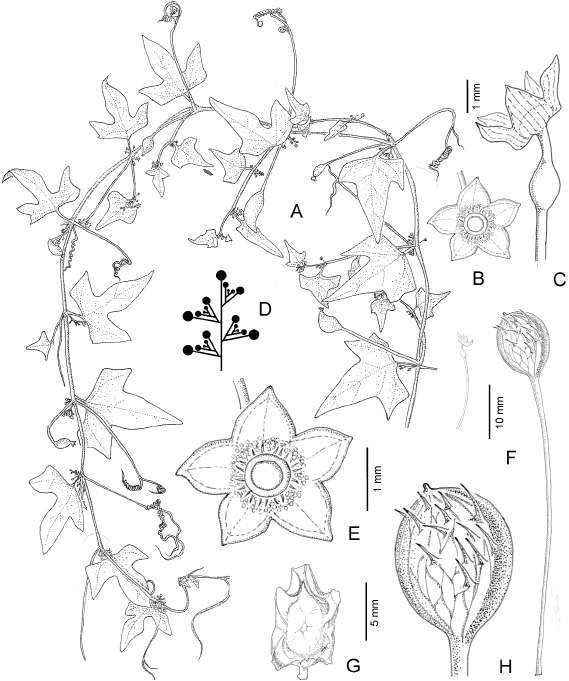 We describe and illustrate Cyclanthera oligoechinata (Cucurbitaceae, Sicyeae) a new species from southern Brazil (Paraná), northeastern Argentina (Misiones), and central and southern Paraguay (San Pedro). This new species resembles C. hystrix, C. eichleri and C. quinquelobata, but differs by its almost smooth fruits, and pistillate flowers and fruits on long, slender pedicels. A key to distinguish C. oligoechinata from the closest species is also included. Keywords. Cucurbitaceae; Cyclanthera; South America; Taxonomy. Resumen. Una nueva especie de Cyclanthera (Cucurbitaceae, Sicyeae) de Sud-américa austral. Se describe e ilustra Cyclanthera oligoechinata (Cucurbitaceae, Sicyeae) una nueva especie del sur de Brasil (Paraná), noreste de Argentina (Misiones), y centro y sur de Paraguay (San Pedro). Esta nueva especie se asemeja a C. hystrix, C. eichleri y C. quinquelobata, pero difiere por sus frutos lisos o casi lisos, y por sus flores pistiladas y frutos con pedicelos largos y gráciles. Se incluye una clave para distinguir C. oligoechinata de sus taxones más afines. Palabras clave. Cucurbitaceae; Cyclanthera; Sudamérica; Taxonomía. Cyclanthera Schrad. is a neotropical genus, mainly of South America, with slight extensions north and south of the tropics, including about an equal number of species in South American and in the Mexican region. According to the last revision made by Lira Saade (1995), the addition of Cremastopus to the synonymy of Cyclanthera (Kearns & Jones, 1992), and new species from Mexico and Central America (Jones & Kearns, 1994; Lira & Rodríguez-Arévalo, 1999) the total number of species is now 31. Species of Cyclanthera are tendriliferous, usually annual herbs, characterized by the gibbous ovary with an apical placenta and few ascending ovules, the fleshy fruit with explosive dehiscence, and the androecium of a single, horizontal, continuous, circular theca. As in the remaining members of the Sicyeae, Cyclanthera shows a central androecial column, nectaries derived from secretory trichomes on the hypanthium (see Vogel, 1981), and 4-6-zonocolporate pollen (cf. Stafford & Sutton,1994; Kocyan et al, 2007), being very close to Rytidostylis Hook. & Arn., Elateriopsis Ernst and Hanburia Seem. (cf. Kocyan et al., 2007). Because of the very reduced, small, uniform flowers, few morphological characters can be used for species delimitation, such as leaf blade division, length and general morphology of the staminate inflorescence, number of ovules/seeds per flower/fruit, fruit surface and size, and peduncle length of both the pistillate flower and fruit. The new species here described was found independently by the authors during a revision of Cyclanthera from Brazil (Lima's Ph.D. dissertation, in prep. ), and for the "Catalogue of Vascular Plants from the Southern Cone" (Pozner & Belgrano, 2008). Cyclanthera oligoechinata L. F. P. Lima & Pozner, sp. nov. TYPE: Brazil, Paraná, Capanema, 15-V-1966, J. Lindemann & J. H. Haas 1376 (holotype MBM; isotype U). Fig. 1. Fig. 1. Cyclanthera oligochaeta. A, habit. B-C, staminate (B) and pistillate (C) flower in their relative sizes. D, diagram of the staminate inflorescence. E, detail of the staminate flower showing the circular (syn)anther, fringed by simple trichomes around the lower side. F, pistillate flower (left) and fruit (right) showing their relative sizes. G, seed. H, detail of the fruit. A, from J. Lindemann & J.H. Haas 1376 (MBM, U); B-H, from A. Krapovickas & C. L. Cristóbal 28878 (CTES, SI). A Cyclanthera hystriche (Hook. et Arn.) Arn. et C. quinquelobata (Vell.) Cogn. similis sed fructu fere laevi et pedunculo longiore, graciliore differt. A Cyclanthera eichleri Cogn. similis sed foliis lobatis et pedunculo fructus graciliore, bene differt. Annual, tendriliferous climber. Stem glabrous, striate, villose at the nodes. Leaves with petiole 10-13 mm long, glabrous; blade ovate, 44 mm × 42 mm, 3-5-lobate, the lobes lanceolateovate, membranaceous, papillose and glabrous on both sides, except puberulent to villose on the veins adaxially and puberulent on the nerves abaxially. Tendrils simple or unevenly bifid, glabrous. Staminate flowers 2.5-2.6 mm diam., in small, short-stalked, axillary panicles 10-18 mm long; pedicel slender, 2.5-3 mm long, glabrous; sepals very reduced; hypanthium patelliform, 1.5 mm diam., with an inner ring of nectarigenous trichomes between the androecium and the petals; petals greenish white, triangular, 0.75 mm × 0.75 mm; androecium with one horizontal, circular rimose (syn)anther, 0.75-0.8 mm diam., on a very reduced stalk (almost sessile), and fringed by simple trichomes around the lower side. Pistillate flowers solitary on long slender pedicels 6-15 mm long, glabrous; ovary ovoid, acuminate, smooth or with very few (2-3) spines, basal ovuliferous zone of 1.5 mm long, acumen of 1 mm long, 4-ovulate; hypanthium 2 mm diam., petals 1.25 mm x 1.5 mm, the stigma globose, sessile. Fruit gibbous, 17-19 mm × 12mm, acute or obtuse on both ends, smooth or scarcely spinose, dehiscence explosive; peduncle 32-43 mm long. Seeds 4 per fruit, compressed, more or less cuadrangular in outline with a micropilar neck and a chalazal beak, 9-10 mm long, 5-6 mm wide and 1 mm thick. Observations. This new species is close to Cyclanthera hystrix (Hook. & Arn.) Arn. and C. quinquelobata (Vell.) Cogn., differing by the almost smooth fruit (echinate in C. hystrix and C. quinquelobata) on a longer (up to 60 mm), slender peduncle (shorter and stouter in C. hystrix and C. quinquelobata), and particularly from C. quinquelobata by the shorter staminate inflorescence (up to 30 mm long) without a differentiated main axis (up to 75 mm long and differentiated main axis in C. quinquelobata). Cyclanthera oligoechinata also resembles C. eichleri Cogn. by the smooth fruit and long fruit peduncle, but differs by the deeply lobate leaves (entire in C. eichleri) and slender fruit peduncle (stouter in C. eichleri). ARGENTINA. Misiones. Cainguás: ruta 7,2 km O del acceso a Aristóbulo del Valle, 28-I-1987, R. Vanni et al. 809 (CTES, NY); Ruta Prov. 7, camino de Aristóbulo del Valle a Jardín América, 11-II-1996, O. Morrone et al. 637 (NY, SI); Parque Provincial Salto Encantado, 13-VI-2004, J. Radins 19 (CTES). San Javier: San Javier, Balneario 4 Bocas, 11 km NE de San Javier, 24-I-1956, A. Krapovickas & C. L. Cristóbal 28878 (CTES, SI). BRAZIL. Paraná. Foz do Iguaçu, 29-VII-1948, J. H. Hunziker 2609 (CTES); Cataratas do Iguaçu, 29-IX-1967, A. G. Schulz s.n. (CTES 16180, MBM 45713). PARAGUAY. Alto Paraguay. X-1909, K. Fiebrig 5704 (SI), 6179 (SI). San Pedro. Primavera, 9-VI-1955, A. L . Woolston 523 (C, NY). 2(1). Segments narrow, irregularly lobate (leaves dissected almost like Abobra tenuifolia Naudin). Tendril stalk about 50 mm long .............C. tenuifolia Cogn. 2. Segments obspatulate, eróse (leaves like Cucurbitella asperata). Tendril stalk up to 30 mm long..............................C. hystrix (Hook. & Arn.) Arn. 3(1). Pistillate flower with pedicel 3.5-8 mm long. Fruit peduncle 13-23 mm long. Fruit echinate...............................C. quinquelobata (Vell.) Cogn. 4(3). Leaves entire to subtrilobed. Staminate inflorescence up to 100 mm long, with a well differentiated main axis. Fruit peduncle stout. . ................. .............................. C. eichleri, Cogn. The authors thank the curators for assistance and loans from the herbaria consulted, João Ricardo Iganci for the drawing of Fig. 1A, and Michael Nee for his constructive review. This research was funded by CNPq and Darwin Initiative Programme.